eleventh hour tangy smoked and pulled pork with creamy buttermilk coleslaw, originally uploaded by aarn! +3rd June, 2009+. rubbed two 7-lb bone-in pork butts with a mixture of 1t. fresh ground black pepper, 1t. ground cayenne pepper, 2T. ground arbol chile, 2T. ground coriander, 1T. dark brown sugar, 1T. dried oregano, 4T. spanish paprika, 3T. kosher salt (ground some of this fine, the thought was that the fine salt would penetrate better and do a different job than the larger crystals), and 1T. ground white pepper, then wrapped in plastic wrap and let sit in the refrigerator for a while and then at room temperature. 9-am, evan from atk arrives. after a run to the local supermarket, the first chimney starter full of coals is fired up. 11-am, the butts are in the offset smoker stoked with hot coals, and chunks of hickory (which had been soaking in water for about 20hrs). the first sight of the bellowing smoke was beautiful. high-fives were exchanged. then the struggle began. after accidentally peaking-out somewhere around 400-degrees, the smoker maintained a temperature near the target temperature of 250-degrees for an hour or so, then dropped to 215, which is where it slowly smoked away for the next four hours. 4-pm, enter marcus from atk. marcus masterfully worked the coals and wood until 11pm. at about 5 or 6-pm the butts were wrapped in aluminum foil and transferred to a 250-degree oven, with a pan of water in the bottom for humidity. the first target for the internal temperature was 150-degrees at the thickest spot (when they were pulled from the smoker), and then at 190-degrees they would be done and ready to pull. the butts cooked away until almost 10-pm when they were unwrapped, pulled in their own juices, and then finished with a tangy bbq sauce. lightly sauteed a large yellow spanish onion in 2T. vegetable oil, with three or four large minced and crushed cloves of garlic, until tender. mixed into the sauce pan 1c. cider vinegar, 1c. worcestershire sauce, 2T. ground dry mustard seed, 4T. dark brown sugar, 4T. spanish paprika, 2T. kosher salt, 2t. ground cayenne pepper, and 2c. catchup, and let this simmer for about 15-minutes. evan cored and chopped fine one medium head of green cabbage, and mixed that together with two large peeled and shredded carrots. set the mess in a colander and tossed with a bunch of kosher salt to let wilt for an hour before being rinsed under cold water and dried. placed the slightly dehydrated carrot and cabbage mixture in a large bowl and tossed in a creamy dressing consisting of 2/3c. buttermilk, 1/4c. miracle whip (oh yeah, barf! ), 1/4c. real mayonnaise, 1/4c. sour cream, 8 scallions chopped fine, 2t. sugar, 1t. spicy dijon mustard, and 1/4t. ground black pepper. 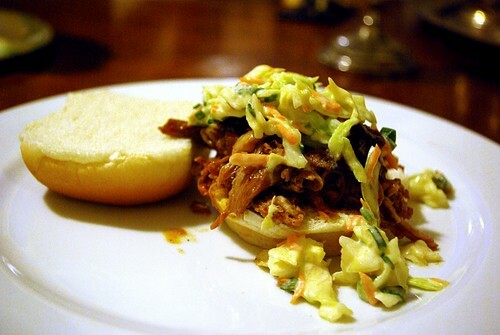 tossed a pile of the juicy pulled pork on some cheap hamburger buns with a helping of the 'slaw on top. best pulled pork i have ever had in my life! Hey man, 1992 called and they want their hit counter back. Get that crap off there. Food looks good too. give me a makeover...this site looks like crap. maybe i should learn how to take a picture too. later later. noted about the counter. someone wearing zubaz climbed through my internets and took it away. You eat some dang good looking food. That sandwich look absolutely amazing. Love coming here-I always end up with a recipe that gets rave reviews. Thanks. can we eat this again soon?